Alice is a scientist. She lives in Geneva. As the Large Hadron Collider starts up in 2008, she’s on the brink of the most exciting work of her life – searching for the Higgs Boson. Jenny is her sister. She lives in Luton. She spends a lot of time Googling. When tragedy throws them together, the collision threatens them all with chaos. How would you cope if your world was turned upside down? There’s the famous phrase that ‘blood is thicker than water’; that family is everything and they’ll always support each other. 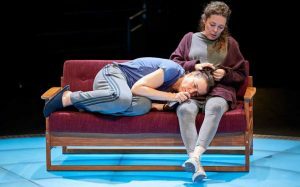 A notion pushed to its limits in Lucy Kirkwood’s spectacular new play at the NT. When the inconceivable happens within your own inner circle, how do you react and most of all – how do you cope? Mosquitoes takes a raw and intimate look into the deepest parts of our lives and paints it beautifully for all to see. Oh, and if you like your physics, there’s a healthy dose of that in there too! It’s not all quite so heavy, as Mosquitoes packs its fair share of comedy; often leaving us in stitches with witty one liners and sassy comebacks. It’s all so reminiscent of real life as therefore is instantly recognisable, which somewhat adds to the humour. The delicate juxtaposition of dark and angst immediately after hilarious comedy is beautifully executed. 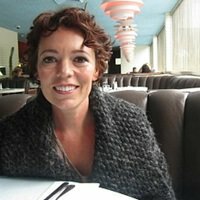 Olivia Colman delivers a sensational performance as Lucy. Raw emotion emanating from every action, this allowed an incredibly powerful sensation to wash over the audience from her first moments on stage. Joseph Quinn’s portrayal of troubled teenager and genius Luke is equally as impressive throughout – some of the best scenes coming from fraught and awkward interactions between the pair. Olivia Williams as Alice creates some of the finest scenes when battling her sister [Colman]. The sisterly bond is well and truly felt and is a testament to the tight knit they’ve formed. It’s all so believable. Katrina Lindsay’s design is a marvel, managing to achieve maximum effect from a small space makes for some visually stunning scenes. The use of projection at such short range, including projecting onto the audience, is powerful. Surrounded on all four sides by the audience, the small stage of the NT’s Dorfman Theatre feels noticeably intimate, even before the play starts. So close to the action, you feel almost as if you’re intruding on their lives; a powerless witness to the crashing of relationships right before your eyes. Raw. Emotional. Poetic. Hilarious. We could continue with the adjectives for days, though the verdict is quite clear: tTis is one piece of theatre you don’t want to miss out on!